Zebra and Datalogic barcode scanners. Our range of handheld scanners have been designed to keep workers more effective. From Zebra, Symbol, Honeywell and Syble - we have a fast, accurate and durable scanner made for your environment and application. We have a number of factors to help you pick your perfect scanner: corded/cordless, 1D/2D scanner, black/white. You've come to the right place to buy a barcode or image scanner. We offer a wide choice of barcode scanners from Motorola, Symbol, Datalogic and Zebra to suit every requirement, including 2D, handheld, laser, linear and Bluetooth scanners. Zebra DS2208 2D corded imager. Zebra DS2278 cordless 2D imager. Zebra DS8108 2D corded imager. Zebra DS8178 2D cordless imager. Zebra LI4278 cordless barcode scanner. 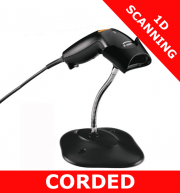 Zebra LS1203 corded barcode scanner. 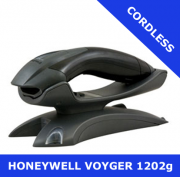 Zebra LS2208 corded barcode scanner. 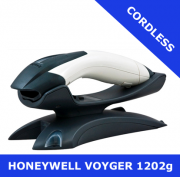 Honeywell Voyager 1202g cordless scanner. Upgrading your business to 2D imaging technology can dramatically improve your workers' efficiency and productivity. Barcode technology can transform the customer's experience in a range of industries from retail and hospitality to healthcare. The unique identifiers, in the form of a 2D barcode, means that manufacturers will be able to load their products into the database (which is held centrally by the European Medicines Verification Organisation) so that they can be recognised and authenticated by the pharmacist by scanning the barcode upon dispensary. 2D scanning technology helps pharmacies to achieve compliance by enabling them to scan, record and verify all medications that the hold on stock and dispense to patients. Compliance with the Falsified Medicines Directive and the introduction of scanners to the workplace will enable pharmacies to improve their stock management processes and prevent falsified medicines from entering the supply chain. 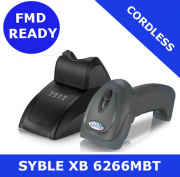 Our FMD ready scanners are handily marked with an 'FMD Ready' badge so that you can easily identify the correct technology for FMD compliance.